Rose Under Fire by Elizabeth Wein. Hyperion, 2013. Currently Available. Face Value: This is a lovely piece of cover artwork that absolutely captures the story. When you have a book that deals with horrors like a concentration camp, it’s a delicate balance to find something that conveys the weight of the situation without an overly gruesome or horrifying image. 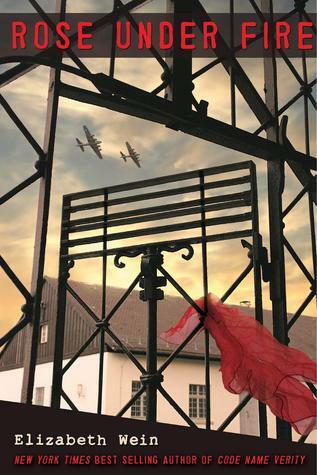 The stark gates and red scarf up against the sky, with planes flying overhead is a lovely and poignant image. Does it Break the Slate? Definitely. I can hardly imagine that a follow up book from the writer of Code Name Verity would ever not be Slatebreaking. But Rose is definitely a Slatebreaker in her own right, and this piece of historical fiction is absolutely a feminist book. Who would we give it to? If you loved Code Name Verity, you won’t want to miss Wein’s companion novel about another fiercely brace pilot (and with our beloved Maddie in a small featured role). If you find Holocaust narratives important and compelling, this is one of the best pieces of concentration camp fiction I’ve come across. Review: I loved Elizabeth Wein’s Code Name Verity. The fast-paced WWII novel about friendship, spies, and intrigue was my favorite book of 2012, and one that I am constantly recommending to people. It’s a standalone novel, but when I heard that Wein planned to write a companion piece, I was absolutely thrilled, and a little bit nervous that it wouldn’t live up to my expectations. I shouldn’t have worried. Rose Under Fire is a very different book than Verity, but it is an outstanding novel in its own right. Rose Moyer Justice is a young American ATA pilot. All she wanted was to get herself to England to be a part of the war, but her whole experience changes when her plane is captured and Rose is sent to Ravensbruck, the concentration camp. She might have died right away if she didn’t become close to the group of women known as the Rabbits, who were the victims of unspeakably horrible medical experiments. Through the Rabbits, Rose understands the need to not only survive, but to tell the world what happened in the camps. In some ways, Rose is a more familiar story than Verity was. The Holocaust has inspired a great deal of fiction over the past 70 years. And certainly I have read a lot of it myself. But reading Rose’s story still feels relevant. It’s not that Wein’s story gives us a new take on concentration camps, it’s more that it is a really well crafted, powerful reminder of not only the atrocities that went on in Ravensbruck and camps like it, but of how individual people still found ways to defy their situation. The structure of the book is also fascinating. It’s written as an epistolary novel – in real time through Rose’s entries until her capture, and her writing out her memories of Ravensbruck after she is safe again. As a reader, I’m willing to suspend my disbelief for her memory of detail because the structure works so well narratively. Knowing that Rose is safe does surprisingly little to lessen the suspense of the story, and her shared conflict of both needing to tell her story to the world and her emotional reaction to finally being safe after experiencing unimaginable trauma makes for a powerful narrative. One of the things that elevated the story for me was the way poetry was beautifully woven into the narrative. Rose is a poet, and she shares her favorite poems, as well as the ones she writes, with her fellow prisoners. It is through art that she understands her experiences, both as they are happening, and after it is over. The poems are beautiful and heartbreaking. Take this one, written for the boy that Rose was dating before she was captured, the boy who becomes a fantasy lens for all of the girls in her bunk as they imagine a happier world before and after. as if it were your due? There won’t be anything to say. Art – in this case, poetry – offers Rose and her readers a way to understand and process horrible things. It’s a powerful tool, and I’m glad Wein chose this as a means for understanding the Holocaust. Rose is a wonderful protagonist – a real hero both for her survival, her strengths and her weaknesses, and her determination to tell the world her story. But this book gives us a whole cast of incredible female characters. I loved that we got a glimpse of Maddie again, seeing her pain at losing Julie and her determination to take care of the people she has left. And when Rose gets to Ravensbruck she meets women who are fighting under impossible odds to survive, to fight back, and to be heard. But none of these characters, Lisette Karolina, Irina, Róza, Karolina, Elodie – none of them are flat victims or blandly drawn heroes. They are complicated, angry and dynamic individuals who are banded together in the worst possible circumstances. And Rose herself changes over the course of the book. How could she not? But the Rose who survives Rosenbruck is not the same Rose who signed up to be a pilot. And seeing her negotiate those changes and trying to retain her sense of self as she moves on with her life is one of the book’s most Slatebreaking elements. This entry was posted in Reviews, Young Adult and tagged Concentration Camps, Historical Fiction, Holocaust, pilots, Ravensbruck, Rebellion, World War II. Bookmark the permalink.